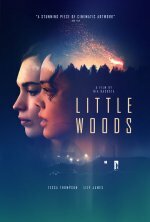 A modern Western that tells the story of two sisters, Ollie (Thompson) and Deb (James), who are driven to work outside the law to better their lives. For years, Ollie has illicitly helped the struggling residents of her North Dakota oil boomtown acce... show all ss Canadian health care and medication. When the authorities catch on, she plans to abandon her crusade, only to be dragged in even deeper after a desperate plea for help from her sister.